Make an impact with the large, refillable pen. Take advantage of the large 2 1/8″ x 1″ imprint area. Enjoy 1.2 miles of uninterrupted writing. 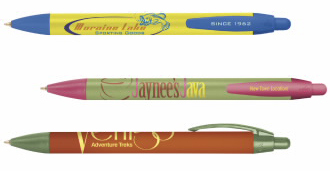 Imprint area for this pen: 2-1/8" x 1"
Shipping U.S. and only Taxes: Added to all Florida & California orders. Orders will be shipped in 6 business days.